This chapter provides an introduction to the Engineering Group of the Geological Society of London (EGGS) Working Party book on the engineering geology and geomorphology of glaciated and periglaciated terrains. A summary of changes in the extent of glacial and periglacial conditions throughout the Quaternary to the present day is provided initially. The engineering difficulties associated with working in glaciated and periglaciated terrains are demonstrated through the inclusion of seven important case histories. The chapter then discusses the background to the Working Party, the scope and structure of the book, including abstracts of each chapter, before finally guiding the reader on how the book may be used at a site where glacial or periglacial conditions had formerly prevailed. In particular, the importance of updating the ground model at each stage of the project as an approach to risk management is emphasized. At present, glaciers only cover about 10% of the Earth’s surface (Owen & Derbyshire 2005; Benn & Evans 2010). That is a total of over 15 million km2, with 99% found in the ice sheets of Antarctica and Greenland. However, over the past 2.6 Ma of the Quaternary Period there have been multiple phases of spatially more extensive ice and permafrost around the globe (see Chapter 2). Even as recently as 18–24 ka at the Last Glacial Maximum this coverage was as high as 30% and, during some earlier glacial advances, the ice coverage was even higher. The former and current global glacial extents are shown in Figure 1.1. Currently active periglacial conditions occur in 25% of the world’ s land area (French 2007) with permafrost (perennially frozen ground) underlying 20%, mainly in the Northern Hemisphere (Walker 2005). The former and current global extents of periglacial influence are shown in Figure 1.2. In most of NW Europe, Asia and North America it is the legacy of these ice advances and retreats, along with the migration of periglacial and permafrost conditions, that dominate the distribution of soils, their engineering geological characteristics and their geotechnical properties. Appreciating the sedimentological inheritance of glacial, periglacial and permafrost processes is therefore fundamental to any understanding of the engineering geology and geotechnical behaviour of both soils and weathered bedrock in Great Britain and similar environments overseas. It was for these reasons that the Engineering Group of the Geological Society of London (EGGS) established a Working Party to produce this state-of-the-art book on The Engineering Geology and Geomorphology of Glaciated and Periglaciated Terrains. Map showing approximate limits of Northern Hemisphere ice sheets at the present day and during the Last Glacial Maximum (LGM). Ice caps and smaller glaciers are omitted. Based on Hubbard et al. (2006), Andrews & Dyke (2013), Ehlers et al. (2013) and Hughes et al. (2016). Former and current Northern Hemisphere permafrost extents. It must be acknowledged that the extent of contemporary glacial and permafrost limits (Figs 1.1 and 1.2) has changed significantly since the 2005 summary paper by Owen & Derbyshire (2005). The changing climate has reduced the permanent ice coverage that has been replaced with newly exposed areas of permafrost/periglacial activity. There are also many reports of loss of permafrost affecting native communities in Alaska and northern Canada (Sven Lukas, pers. comm. 2016). It is anticipated that these changes will continue in response to global climate change (ACIA 2005; IPCC 2014), which means that the extent of formerly glaciated and periglaciated terrains will continue to increase. The driving mechanisms for present-day climate change are considered to be outside the scope of this book; here, the focus is on the engineering geology and geomorphology of glaciated and periglaciated terrain resulting from Quaternary stadials. As a general rule, engineering geologists and geotechnical engineers are typically only concerned with the upper few metres, or tens of metres, of ground that underlie a site of interest. This is in contrast to hydrogeologists, mining geologists and petroleum geologists whose zone of interest is the upper hundreds to thousands of metres of ground that host their resources. While it is important for engineering geologists to understand the formative processes and resulting materials and structures of the ‘deep geology’, it is generally the geological events of the Quaternary that have an overwhelming influence on the characteristics of the near-surface rocks and soils (Fookes 1990,1997a, b), as illustrated in Figure 1.3. The importance of geological time (after Fookes 1990; Fookes et al. 1997a, b). The extent of the dominant glacial and periglacial influence in the top few tens of metres means that many engineering structures are located within these variable and complex soils and rocks. A glossary of ground conditions that could be encountered (Chapter 3) helps to confirm the variability and complexity that might be seen during an engineering project. This ranges from regional-scale structures found during the desk study and walkover to a micro-scale soil fabric that can have a profound influence on construction safety, cost and programme, and which can only be identified from a detailed examination of soil samples. To demonstrate how it is critical to understand the nature and formation of glacial and periglacial terrain to overcome engineering difficulties, a selection of seven case histories is presented in Section 1.2. These case histories are presented in order of age, starting in 1908, and demonstrate some of the typical engineering problems that have been encountered over the past 100+ years working in these materials. However, this is only a very small sample of the many examples that can be found in the scientific literature (e.g. Kiersch 1991). While Section 1.2 sets the historical context for the work, Section 1.3 presents the background, aims and specific objectives of the Working Party. In Section 1.4 the scope of this book is summarized and Section 1.5 provides the structure of this book, including the abstracts of Chapters 2–9. Finally, Section 1.6 guides the reader on how the book may be used at a site where glacial or periglacial conditions have prevailed. In particular, the importance of updating the ground model at each stage of the project as an approach to risk management is described. The engineering geological importance of former periglacial and glacial conditions is illustrated by the following seven case histories of engineering failures that resulted from a lack of appreciation at that time of the influence of periglacial and glacial processes on materials and landforms. These case histories have been selected to demonstrate the effect of such features on a wide range of national and global engineering projects including tunnels, dams, transport infrastructure, slope instability, building foundations and offshore structure foundations. Further case studies in Chapter 9 demonstrate the successful application of the engineering geological and geomorphological principles advocated in this book to successfully solve challenging engineering problems. The case histories presented below are in chronological order and reflect the state of knowledge and understanding by the geologists and engineers at the time of the projects. While the tunnel construction through a glacial overdeepened valley presented in Case History 1.1 at Lötschberg occurred over 100 years ago, it is a classic example of the ability of a glacier to over-deepen a valley to such depths not thought conceivable from the scientific knowledge at that time; it was a case of an ‘unknown unknown’. Today’s updated landsystems approach to the understanding of these terrains (Chapters 4 and 5) now contributes to more robust ground models and therefore more carefully targeted ground investigations based on the lessons learnt from this case history. An example of these advances is presented later in this volume in Chapter 9. Case Study 9.2 (the occurrence of subglacial channels that could have affected the M18 motorway in Yorkshire, UK) illustrates an example of the successful anticipation of buried valleys, albeit not to the great depth encountered during the Lötschberg Tunnel disaster. The scale of Pleistocene glacial processes is now widely recognized and Lötschberg (Case History 1.1) marked just one step forward in the glacial sciences, albeit an unfortunately expensive and tragic step. Nearly 60 years after the Lötschberg tunnel disaster, Case History 1.2 marked another important step forward, this time in understanding the influence of periglacial processes on the landscape in which engineering was taking place. Prior to the understanding of reactivation of solifluction shear surfaces that developed during this case history, conventional soil mechanics could not explain landslides at such shallow slope angles. The understanding developed by the engineers in Case History 1.2, and crucially communicated effectively to the industry, allowed the teams working on the M25 motorway around London to have an awareness of the potential existence of relict periglacial shear surfaces. The occurrence and effects on M25 engineering works, where such shear surfaces were encountered at Denham Corner, Buckinghamshire and Flint Hall, Surrey are described in case studies 9.15 and 9.16 in Chapter 9. The Lötschberg Tunnel disaster in 1908 in Switzerland was an engineering catastrophe caused by a simple lack of contemporary understanding of glacial processes (Waltham 2007, 2008, 2009). Nearly 14 km long, the tunnel was designed to carry a railway beneath the crest of the Bernese Oberland. The alignment was determined by topography, providing the shortest link at an attainable altitude between the Kander Valley on the north side and the Lonza Gorge on the south side. By a quirk of the Kander’s own alignment, the tunnel would have to pass directly beneath an upper section of the valley known as the Gasterntal (Fig. 1.4). The glaciated trough of the Gasterntal, looking up-valley from the Stock hill; the 1908 tunnel breakthrough created a valley-floor sinkhole in the woodland just beyond the furthest of the large open meadows (© Tony Waltham Geophotos Ltd). It was a bold engineering project and was only the third of the great Alpine railway tunnels, following in the wake of the Gotthard and Simplon (Kovari & Fechtig 2000). However, at that time tunnelling capabilities were far ahead of the knowledge base of the geological sciences. Less than 100 years previously there was no concept that Alpine landscapes and valleys had been excavated, or at least modified, by glaciers that had been far more extensive than their modest descendants still surviving around the higher Alpine peaks. Moreover, nobody really understood that glaciers could move uphill. Some 3 km in from its northern portal, the Lötschberg Tunnel had to pass beneath the floor of the Gasterntal at a depth of 172 m (Fig. 1.5). The flat floor of that valley is very clearly filled with alluvium, but the idea of alluvial sediments being more than 172 m deep was beyond any concepts of the current geological thought. Furthermore, downstream of the tunnel crossing, the Gasterntal narrowed into the Klus Gorge, where a bedrock valley floor is visible at an altitude only a few metres lower than that of the river above the tunnel. Questions were raised about the depth of the sediments on the tunnel line, but concerns were allayed because no-one could conceive of a valley floor increasing in elevation by 180 m in the downstream direction. A commission of geologists, perhaps politically motivated, concluded that there was no danger to the tunnel and dissenting voices from elsewhere were quietly suppressed. Plan and profiles of the Gasterntal and Klus Gorge (through the abandoned tunnel heading) around the Lötschberg Tunnel site (© Tony Waltham Geophotos Ltd). A borehole nearly 180 m deep into sediment would have been a difficult operation at that time, and was regarded as being excessively cautious and too expensive. Surprisingly, the obvious precaution of using advance probes from the heading when approaching the Gasterntal’s margin was not included as a design feature. Consequently, the tunnel face was advanced by conventional drill-and-blast. On 24 July 1908, a routine blast removed the last bit of rock and precipitated a massive inrush of saturated gravels that had formed the sediment fill in the over-deepened Gasterntal. The avalanche of sand, gravel, mud and water ran down the tunnel for more than a kilometre, killing all 25 miners in the face team. The water soon drained out, and the sediment formed a very solid plug. A diverted tunnel heading curved around the Gasterntal and successfully met the opposite heading nearly 3 years later. The new sinkhole and whirlpool on the floor of the Gasterntal was soon filled by the river and lost to sight. The Lötschberg Tunnel made a classic breach of unmapped rockhead. Unfortunately this was into a hugely overdeepened glaciated trough, which is effectively a very deep buried valley. Boreholes subsequently placed into the Gasterntal floor found unconsolidated sediments of more than 220 m in depth. Since then, even deeper sediment fills have been found in glaciated valleys within mountain chains elsewhere in the world. The new Lötschberg Base Tunnel has been more recently driven safely beneath the Gasterntal, at a level some 400 m below the original railway tunnel. The slope failures that occurred in 1965 during the construction of the Sevenoaks Bypass in Kent, UK led to a new understanding of the behaviour and geotechnical properties of clay slopes (Weeks 1969, 1970; Skempton & Weeks 1976). The failures occurred in the natural ground during earthworks construction on the south-facing scarp slope of the Greensand Ridge that lies just to the south of the North Downs in Kent. The Greensand escarpment is part of the eroded Wealden Anticlinorium and comprises the Cretaceous-age Hythe Formation overlying clays of the Atherfield Clay and Weald Clay formations. The Hythe Formation is made up of Ragstone, typically a strong sandy limestone, interbedded with Hassock, which is a weak calcareous sandstone. The relatively competent Hythe Formation was affected by large-scale rotational landslides; however, it was the relict solifluction lobes overlying both the in situ and landslide-displaced bedrock that the original alignment cut through, and it was these that were reactivated during the construction works. The detailed ground investigations carried out after the failures identified two solifluction sheets at the site, the upper 4 m thick and the lower c. 3 m thick, together comprising a clayey head. The lower solifluction sheet directly overlay in situ Weald Clay. The upper solifluction sheet ended in a distinct lobe about 400 m from the scarp slope, and where the earthworks failure occurred the slope angle was just over 3°. Solifluction is the term used to describe a combination of two slow geomorphological processes, namely soil creep and gelifluction (slow soil flow associated with thawing ground; Ballantyne & Harris 1994). However, trial pits in the solifluction deposits revealed extensive pre-existing shear surfaces at low slope angles parallel and sub-parallel to the ground surface (Figs 1.6 and 1.7a, b). Based on this evidence it appears that the slides at Sevenoaks were the much more rapid ‘active-layer detachment slides’ (Lewkowicz 1990) reactivated by the road excavations, although the literature does refer to the failures as being reactivated solifluction lobes. This type of slide develops when thawing of the active layer in the permafrost occurs very rapidly. Between the two solifluction sheets was a palaeosol that was dated at a radiocarbon age of 12 ± 0.2 ka BP; this indicates that the upper sheet accumulated during the Loch Lomond stadial whereas the older sheet would have formed earlier during the Devensian. Plan and section through solifluction lobe (modified from Brunsden et al. 1988). Pit F2, Sevenoaks bypass (modified from Skempton & Weeks 1976): (a) shear surfaces in Pit F2; and (b) polished shear surface in Pit F2 (Weeks 1969). Following the failures, stability analyses were undertaken using measured residual shear strength parameters; these predicted that the critical slope for sliding when the ground was fully saturated was between 6 and 8°. As solifluction involves the movement downslope of saturated soil it is especially effective in over-consolidated clays when the whole active layer detaches itself and slides over frozen ground at depth, thereby creating the extensive, broadly slope-parallel slip surfaces towards the base of each solifluction lobe or sheet. Detachment slides of solifluction sheets have been recorded on slopes as low as 3° to the south of Sevenoaks and up to 4 km from the Hythe escarpment. In the publication following the failure, Weeks (1969) hypothesized that frozen ground may have sealed in groundwater and thus impeded the drainage, building up excess porewater pressures. However, it is now recognized that the mechanism that enables a solifluction slip mass to move down such very shallow slopes, as first identified at Sevenoaks, involves the development of abnormally high porewater pressures during thaw of segregated ice at the base of the active layer and/or top of the permafrost in late summer (see Chapter 5). The frozen ground surface allows piezometric pressures to develop above ground level in the trapped saturated soils. Under present-day conditions, most undisturbed relict soliflucted slopes in over-consolidated clays are only likely to be unstable in winter when groundwater levels/pressures reach ground level, but are not a widespread phenomenon. The limiting slope angles have been shown to be approximately half the residual shear strength of the clay concerned, except where the slip mass is under-drained. However, small excavations into or additions of fill on these slopes can initiate failures. The general pattern of shallow periglacial landsliding that was first identified at Sevenoaks was shown by Hutchinson (1991) to be found over much of the outcrop of argillaceous bedrock in southern Britain. The landsliding that occurred at Sevenoaks in 1965 was of considerable size and was moving at a speed that was detectable without instrumentation. The landsliding occurred on soils that were much more sensitive to changes in porewater pressure and loading regime than was previously understood. However, the landslide that occurred at Rissa, Norway in 1978 (Case History 1.3) demonstrated a scale and speed of movement that was a number of orders of magnitude greater than occurred at Sevenoaks. At Rissa the landslide swept away an area of around 330 000 m2 over a total time of about 40 min (Gregersen 1981). The open texture of the metastable quick clay that formed this landslide was highly sensitive to minor changes of load and associated pore pressure increases. The ratio of the strength of the ‘remoulded’ quick clay compared to intact quick clay is now routinely investigated in areas where the clay occurs. The quick clay was laid down in a glaciomarine environment and, while limited in spatial extent, the deposit represents a very significant natural hazard. While at Rissa the deposits that failed were glaciomarine, in Case History 1.4 from Volgodonsk in Russia it was another form of open-textured metastable deposit that collapsed. In this case the foundation materials were wind-blown loess and construction loading in the early 1980s resulted in the sudden loss of strength of the ground. Although the windblown loess ground conditions found at Volgodonsk were initially recognized as collapse-prone soil, considerable additional losses were incurred due to differential settlement. A change from the proposed piled foundation to a shallow foundation solution in these sensitive soils as a measure to save construction costs did not pay off, even with an attempt at groundwater control. In Case History 1.5 (Carsington Dam, UK), as at Volgodonsk and Sevenoaks the impact of the ground conditions was either not recognized or underestimated, causing an embankment dam failure. At Carsington it was the reactivation of movement along periglacial shear surfaces during the construction of the dam in 1984 that occurred, and this was nearly 20 years after the 1965 failure at Sevenoaks reported in Case History 1.2. Clearly, the lesson that residual shear surfaces might exist in soliflucted material had not become embedded in ground model development and ground investigation design at that time. In geotechnical engineering there was also a lack of appreciation of the importance and extent of relict periglacial conditions in the specific locality. Contrasting with the situation at Carsington (Case History 1.5), in Case History 1.6 the highly sensitive and variable ground along the proposed alignment of the A51 Grenoble to Sisteron Autoroute was recognized, and had impacted on route selection since the 1960s (Martin et al. 2005). The construction of this autoroute has been controversial since the first section was built in 1953 (Martin et al. 2005) due to the design, cost and environmental impact of the road that was partly influenced by the glacial ground conditions. The problematic ground conditions were the product of deposits laid down in a large ice-dammed glacial lake which included glaciolacustrine silt and clay sequences interbedded with both subglacial till and supraglacial diamicton. These highly variable deposits were prone to instability, including slope and bearing capacity failure, differential settlement and liquefaction. Their problematic nature, especially their propensity to liquefaction, had the potential to significantly impact the integrity of embankments and cuttings along the road alignment. The targeted ground investigation and ground model were developed from the century-old knowledge advances in the geological sciences, combined with experiences from some of the costly mistakes highlighted in such case histories reviewed above. An important aspect of the glacial and periglacial environment during Quaternary stadials is that they were associated with lower sea levels and therefore exist in areas of the continental shelf now covered by shallow seas. The design and investigation of all offshore infrastructure development need to take this into account. Case History 1.7 presents the findings of an offshore ground investigation carried out in 2010 and, as with the example from the A51 Autoroute (Case History 1.6), this more recent case history demonstrates a developing awareness of the complexity of the ground associated with former glacial conditions. The project team working on the offshore ground investigation in the North Sea were able to build on an understanding of potential variability of the ground in that environment, and sought examples of nearby similar terrestrial ground conditions to validate their ground model. ‘Quick’ clays are sensitive marine or brackish-water sediments, generally deposited in late-glacial and postglacial periods. Leaching of salt from the deposit leads to a significant reduction in its remoulded strength so that when they are disturbed they behave as a liquid. Quick clays were mostly deposited during ice-sheet recession at the close of the last Devensian/Weichselian/Wisconsinan glaciations, and are normally <12 ka old. These deposits have been identified in coastal areas in Scandinavia, the St Lawrence Basin, the Hudson Bay Lowlands, British Columbia, Alaska, eastern Canada and Ariake Bay in Japan. As yet no quick clay deposits have been identified in the Southern Hemisphere (Torrance 2012). Landslides in quick clays are well documented (Lefebvre 1996; Torrance 2012) but, although not the first identified, the best known is the 29 April 1978 failure that occurred alongside Lake Botnen, Rissa in Norway thanks to some amateur film footage (https://www.youtube.com/watch?v=3q-qfNlEP4A); (Fig. 1.8 and Chapter 6, Section 6.3.3). The slide contained 5–6 million m3 of material and was the largest slide in Norway in the twentieth century; while damage to property was significant, only one person died. The failure was initiated when a farmer excavated a pit on his land and stockpiled the extra material on the edge of the lake. This extra weight was too much for the clay to support, causing an initial small landslide to start when 80 m of the lake shoreline collapsed. Over the next 40 minutes there was slow retrogression of the landslide, as a series of small slides occurred where the debris liquefied and flowed away, leaving a 450 m long scar. Suddenly a flakeslide occurred where the quick clay collapsed under a thin coherent crust, taking away a block of 150 × 200 m size, which then liquefied as it moved over the natural slope. Retrogressive flakesliding continued, extending the scar c. 1 km over the next 5 min, equivalent to a rate of >10 km/hour. Not only did the landslide erode headwards from the lake, it also caused great damage to the community of Leira when a 3 m high seiche wave reached the opposite bank of the lake, representing a significant secondary hazard. Rissa Slide overview, Norway, 29 April 1978 (© NTB Scanpix and NGI (Norwegian Geotechnical Institute) and reproduced with their permission). According to Torrance (2012) quick clay ‘exhibit a wide range of strengths, sensitivities, clay-size contents, relative mineral abundances and geotechnical behaviours’. One of the main ways to avoid failures such as Rissa 1978 is to identify the extent of quick clay deposits through effective ground investigation and undertake probabilistic risk assessment (Cassidy et al. 2008). Nevertheless, approaches using injected saline solutions have been devised that strengthen the deposits in situ with some success (Moum et al. 1968). Seven case histories have been presented, demonstrating the complexity and variability of ground conditions associated with formerly glaciated and periglaciated environments. Although the case histories were chosen to demonstrate how these ground conditions have adversely impacted on the engineering solutions, they also demonstrate an increasing understanding and advancing awareness of these ground conditions and their implications with time. Case History 1.1, the Lötschberg tunnel disaster, was undertaken when the understanding of glacial processes on the terrain was incomplete; although a ground investigation was undertaken, it was insufficient and limited by the knowledge of the day. Hutchinson & Fookes (2004) note that, particularly from the 1960s onwards, studies of Quaternary geoscience expanded exponentially; this coincided with the leap in understanding related to reactivated palaeo-shears, developed from the detailed investigation into the landslide that occurred at Sevenoaks in 1965 (Case History 1.2). At this time, fast-paced developments in Quaternary geoscience were running alongside developments in soil mechanics. Lessons were learnt from the spectacular failures at Rissa (Case History 1.3), Volgodonsk (Case History 1.4) and Carsington Dam (Case History 1.5). The knowledge of these failures and advances in understanding have been employed to develop more robust ground investigations, and this is illustrated in case histories 1.6 and 1.7. The result of the increasing understanding of ground conditions in these formerly glaciated and periglaciated environments has resulted in very successful engineering projects in these complex ground conditions; examples are presented throughout this book and specifically in Chapter 9. Reflecting on the case histories presented in this first chapter, it is possible to see the growing realization for a holistic approach to understand the natural complexity of the materials and processes encountered in glacial and periglacial environments. Physical geography, Quaternary studies and stratigraphy, engineering geology, hydrogeology, soil and rock mechanics, geotechnical design and construction all have a contribution to make in this field of work (Bell 2007). Foundation problems were reported relating to the construction of dozens of high-rise residential buildings in the early 1980s in Volgodonsk in the Rostov Oblast region of Russia. Loess deposits up to 20 m thick underlie the site and exhibited what was described as a ‘Type II collapsible behaviour’. Russian practice is to categorize collapsible soils into Type I and II according to their code of practice (SNiP 2.02.01-83 1985). Type I soils undergo collapse when wetted only if also subjected to additional loading (e.g. building loads). Type II soils when wetted undergo significant collapse under selfweight alone. The magnitude of self-weight collapse of Type II soils may be significantly greater than for Type I soils throughout the full depth of the collapsible soil stratum. Volgodonsk is situated on the 4th terrace and slopes of the River Don. The loess deposits are understood to typically comprise coarse to medium silt (47%) and fine silt and clay (46%), with a natural moisture content of 17%, a bulk density of 1.80 Mg m−3 and porosity of 43% (Trofimov et al. 2015). The development at Volgodonsk included two nine-storey residential blocks, which were commissioned in 1982 (Fig. 1.9). The initial concept was for these buildings to be founded on piles; however, in order to save construction costs, the foundations were changed to shallow reinforced cast in situ concrete crossed ground beams resting on 3 m depth of recompacted soil. At the same time, unspecified collapse and water control measures were implemented, but these proved to be ineffective. Two nine-storey residential blocks in Volgodonsk. After about a year of occupation, settlement problems of the blocks became apparent. Grigorian (1991, 1997) reported the cause of this being due to top-down wetting caused by defective water utilities. This uneven wetting of the collapsible loess resulted in differential settlements of up to 1 m, with tilting of buildings exceeding 0.009 (1/111). A number of the buildings had to be evacuated and extensive repairs undertaken. High-rise buildings in Volgodonsk have subsequently been constructed using pile foundations through the full thickness of the collapsible soils. No further settlement problems have been reported. Total financial losses from loess subsidence in Volgodonsk reached US$ 400 million by 1996 (Exogenous Geological Hazards 2002). An embankment dam was to be constructed 3 km south of the village of Carsington, Derbyshire, UK. An extensive ground investigation was carried out, but failed to recognize the periglacial features. Consequently, the embankment failed during construction in June 1984 and then had to be demolished and rebuilt to a design based on the correctly understood ground conditions. The reconstruction was successfully completed, but at a considerable cost and delay to the client. The finished reservoir was opened in 1992. The site lies in a broad valley with an alluvial floodplain up to 80 m wide. Bedrock is Upper Carboniferous (Namurian) mudstone with occasional thin bands of sandstone. Till up to about 5 m thick and patches of glaciofluvial gravel exist on the neighbouring higher ground. The valley side slopes, typically inclined at 4–6°, are mantled by a layer of head (i.e. periglacial slope deposits) averaging 1.2 m inthickness. A typical profile through the head deposits (Fig. 1.10) reveals topsoil and a silty subsoil (a1) overlying a plastic yellow-brown mottled clay (a2), containing scattered fragments of sandstone and rare quartz pebbles derived from the glacial deposits. The head overlies a layer of completely weathered mudstone (b1) almost identical to a2 except that it has no ‘foreign’ inclusions (Skempton et al. 1991). For geotechnical purposes a2 and b1 can be classed together as ‘Yellow Clay’. Below this, the weathered mudstone is dark grey in colour and changes with depth from clay (b3) to a brecciated material (b4) and then to an extremely weak mudstone (b5). Weathering extends to a depth of over 10 m. Anomalous superficial folding of these materials was also noted at several locations, probably also the result of periglacial freeze and thaw processes (Aitkenhead 1984). Typical transported and weathered soil profile. The downslope movement of the head (probably representing the active layer under permafrost conditions) gave rise to shear surfaces at or below the junction of a2 and b1 and sub-parallel to the ground slope (Figs 1.11 and 1.12). The shear surfaces are smooth, unpolished, gleyed, undulating and have a characteristic length of about 3 m. On average they occupy 40% of the total length (56 m) of sheared ground examined. Logged section through head and in situ mudstone. Photograph of logged section shown in Figure 1.11. The individual shear zones were up to 2 mm in thickness and comprised clay mineral aggregates aligned sub-parallel to the shear surface; the aggregates outside the shear zones were randomly oriented. It is important to note that identification of these shears in freshly excavated clay was not possible; the clay had to be allowed to dry out for several weeks to be observed. This has important repercussions in site investigation practice in such circumstances. The presence of solifluction shears will reduce the overall or bulk strength of the Yellow Clay. Residual strength on the shear surfaces is reached before the peak strength of the unsheared clay is developed (Skempton & Petley 1967). Consequently, the peak parameters for the layer as a whole will be c′ = 6 kPa, ϕ′ = 17°. The peak bulk strength is then about 14% lower than that of the intact clay; such a reduction would for example cause a factor of safety of 1.5, based on intact strength, to fall to 1.29. This reduction could be further increased by a tendency for progressive failure; at Carsington the combined effects on the Yellow Clay produced a reduction of about 22% in the factor of safety (Skempton 1988) and failure of the embankment resulted. The A51 Autoroute was commissioned to provide a relief road for the A6 Rhone Corridor motorway which connects Paris to the holiday regions of the south of France. The last remaining component of the Autoroute was the section between Grenoble and Sisteron. This section was to pass through the highly problematic ground conditions of the Trièves area and had been the subject of many investigations and research since the 1960s, before a final route alignment was selected and agreed upon (Martin et al. 2005). Even at the construction tender stage this section remained controversial with several initial design proposals being rejected because of the uncertainty in the ground conditions, specifically with regard to the nature of the glaciolacustrine and till sequences. During the last period of maximum glacial advance in the Trièves region (late Weichselian), a large ice-dammed glacial lake developed which gradually infilled with glaciolacustrine silt and clay sequences (including laminated ‘varved clays’) and interbedded till sequences representing ice readvances (Fig. 1.13). These deposits rest on older Eemian Interglacial sediments and on underlying Jurassic carbonate-dominated bedrock (Jongmans et al. 2008). The thickness of the glaciolacustrine deposits varies between less than 0.1 m and a maximum of 200 m. These sediments are highly prone to instability and have given rise to some spectacular rotational mudslides and subsequent mudflows in the area (Fig. 1.14). In detail, the differing facies associated with the former glaciolacustrine environment include rhythmically laminated silt and clay sequences, deeper water turbidites and ice-rafted debris (Fig. 1.15). These are interbedded with both subglacial tills and supraglacial mass flow diamictons, demonstrating the highly dynamic nature of the former ice-contact glacial depositional environment. The spatial distribution and geotechnical properties of the glaciolacustrine silts and clays have been extensively investigated with respect to the potential alignments of the A51 Autoroute (Giraud et al. 1991). Their problematic nature, especially their propensity to liquefaction, has the potential to significantly impact on the integrity of embankments and cuts along the road alignment. Extent of the glaciers at the Weichselian Maximum (equivalent to the Late Devensian in the British Isles; see Chapter 2) and location of the major proglacial lakes (after Monjuvent 1973). The landslide complex at Harmallière in the Sinard sector (figure on extreme right indicates scale). Glaciolacustrine sediments of the former Lac du Trièves (image shows an approximate 1.5 m section). The existing river system and drainage network also presented difficulties for the route alignment. The site topography required a large fill section with embankments to be constructed for access to the northern tunnel portal. The maximum height of the fill section reaches 17 m above the original ground level. The substrata at the base of the embankment section vary between the Trièves glaciolacustrine deposits and the limestones of the main slope. The geotechnical profile of the foundation strata of the fill section was complex with a strong contrast between the ground conditions at either end of the embankment. The limestone bedrock of the slope was covered by a substantial thickness of superficial deposits such as moraine ice debris along with the varved clay/silts of Trièves. The geotechnical risks were considerable at this particular location. Slope failures or bearing capacity failure of the glaciolacustrine clays were potential problems, along with differential settlement. The ground conditions were quite variable, including the potential for the sensitive clays and silts to liquefy and flow. Geotechnical testing was undertaken to profile the ground conditions, and included pressuremeter tests, penetrometer tests and an in situ direct shear test known as a phicometric test (Monnet 2015). These in situ investigations were complemented by laboratory tests including full geotechnical description, triaxial compression tests and oedometer tests to profile the compressibility and creep characteristics of the glaciolacustrine deposits. Studies undertaken on the stability of the embankment yielded the following parameters. Undrained shear strength: Su = 65 kPa for 0-2.50 m; Su = 70 kPa for 2.5–13 m; and Su = 85 kPa for >13 m. Coefficient of consolidation: cv=1.6×10−7 m2 s−1; and cr=8×10−7 m2 s−1. Slope stabilization and embankment construction works were phased as shown in Figure 1.16. In this case history, the long period of investigation and extensive ground investigations had enabled the scale of the risk to be correctly evaluated and the geotechnical designs had been able to allow for the difficult ground conditions. This demonstrates the increasing awareness of the complexity of ground conditions in formerly glaciated and periglaciated terrain. Typical cross-section of embankment with work schedule (after Martin et al. 2005). A geotechnical ground investigation was undertaken in the Outer Wash to gain a better understanding of the geological conditions and geotechnical parameters at a proposed offshore wind farm. The ground conditions comprise Upper Cretaceous Chalk overlain by Pleistocene glacial and interglacial formations. In turn, these are overlain by a variable thickness of Holocene seabed sediments. The water depth across the site varies over the range 6–26 m.
A schematic cross-section of the Outer Wash highlighting the presence of infilled tunnel valleys and the lateral variability of units is shown in Figure 1.17 (British Geological Survey 1991). Information on the geology of the Outer Wash is provided by Cameron et al. (1992). Schematic cross-section for the Outer Wash, showing the ground conditions interpreted by the British Geological Survey (1991). tk, Undivided Mesozoic Strata (chalk); SBK, Swarte Bank Formation; EG, Egmond Ground Formation; BDK, Bolders Bank Formation; BCT, Botney Cut Formation; qh, Holocene Sediments (note that at this time the BGS were still using the term ‘drift’ to describe Quaternary sediments). During the ground investigation which was undertaken in 2010, a tunnel valley was interpreted to cross the site in a north-south direction. At its maximum, the floor of the tunnel valley was identified in boreholes at 55 m below ground level. Interpreted to have been eroded into the chalk during the Anglian Glacial Stage, the tunnel valley was subsequently infilled with till of the Swarte Bank Formation. A borehole located near the mid-point of the tunnel valley encountered a 7 m thick sequence of intact chalk within the Swarte Bank Formation, as summarized in Table 1.1. The intact chalk was interpreted as a glaciotectonic raft that had been detached from the bedrock beneath the Anglian Stage ice sheet, and then transported and deposited within the till (Swarte Bank Formation) that infills the tunnel valley. Note that the strata above the Swarte Bank Formation have not been detailed for brevity (Lord et al. 2002). Glacial rafts are widely recognized in glaciogenic sequences (e.g. Christiansen 1971; Moran 1971; Ruszczynska-Szenajch 1976, 1987; Stalker & Mac 1976; Ringberg et al. 1984; Aber et al. 1989; Hopson 1995; Burke et al. 2009) and are defined as ‘dislocated slabs of bedrock and/or unconsolidated sedimentary strata that have been transported from their original position by glacial action’ (Ruszczynska-Szenajch 1987). The glacial raft was encountered in only one borehole and the project’s geophysical survey could not determine its size. No dating of the chalk was undertaken to help determine where the chalk raft could have been transported from; however, as the chalk was logged as intact, it may only have been transported a short distance (perhaps in a frozen state). 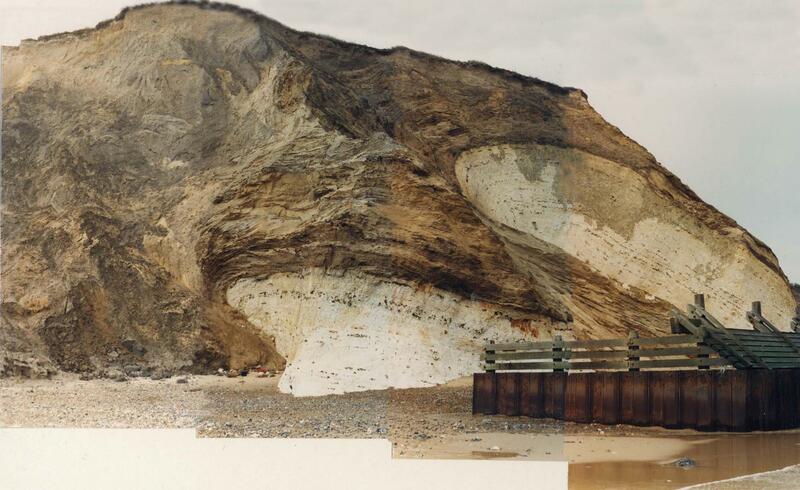 An onshore example of glaciotectonic rafts of chalk is exposed in the coastal cliff at Sidestrand, Norfolk (Fig. 1.18). The rafts are approximately 50 km from the offshore windfarm site, and may be of a similar size to that interpreted to have been encountered at site. However, differences in the host material exist between these two examples: the Sidestrand raft had been deformed within the marine sands and gravels of the Wroxham Crag Formation, while the Outer Wash raft had been deformed within and deposited with till of the Swarte Bank Formation. This case history illustrates how difficult it can be to define bedrock suitable for foundations in glacial materials. Exploratory holes in ground investigations need to be taken to depths that enable displaced bedrock rafts to be identified or discounted and, if possible, the extent of any glacial rafts should be established through geophysical investigations. Rafts of chalk emplaced within shallow marine sands and gravels of the Wroxham Crag Formation, exposed in the cliff face at Sidestrand, Norfolk; the upper raft is about 10 m thick measured vertically (photograph from The Northfolk Project 2015). The topic of the 25th Annual Conference of the Engineering Group of the Geological Society (EGGS) in 1989 was ‘Quaternary Engineering Geology’, with the proceedings being published in the extremely popular Engineering Geology Special Publication no. 7 (Forster et al. 1991). As a collection of papers, this has proved to be a very useful source of information for engineering geological academics and practitioners alike; however, very little engineering geological research has been carried out into the subject since the conference, as indicated by reference to later works by Trenter (1999) and Clarke (2012). EGGS therefore decided that the topic would benefit from an update to incorporate the wealth of academic advances and professional experience acquired in recent years. Following a recommendation by the Hot Deserts Working Party (Walker 2012) and endorsement by EGGS, a Steering Group was established in November 2010 to explore the options for a new Working Party on Periglacial and Glacial Engineering Geology. This new Working Party would be tasked with producing a book in the form of this Engineering Geology Special Publication (EGSP) on the Engineering Geology and Geomorphology of Glaciated and Periglaciated Terrains. It is intended that this book will provide essential guidance for engineering geomorphologists, engineering geologists and geotechnical engineers working in such problematic ground conditions. This new book is also intended to complement guidance on other types of problematic ground conditions associated with tropical residual soils (Fookes 1990,1997a, b) and hot deserts environments (Walker 2012). The Steering Group comprised Mr John Charman (Chair), Mr Chris Martin (Secretary), Dr Dave Giles, Professor James Griffiths, Professor Julian Murton, Dr Kevin Privett and Professor Mike Winter. The Steering Group met three times in 2010 and 2011, with key outputs including a Publication Proposal and draft Terms of Reference for the Working Party (Text Box 1.1). The outline of the Publication Proposal was presented and ratified at the EGGS Forum on Quaternary Engineering Geology on 24 November 2011, where it received extremely positive support from the wider geography, engineering geology and geotechnical engineering communities. The Publication Proposal was subsequently approved by the Geological Society Executive Secretary and the Geological Society Publishing House. Members of the Working Party (Fig. 1.19) were drawn from individuals with known periglacial and glacial engineering geological expertise from across academia and engineering practice, including geomorphologists, engineering geologists and geotechnical engineers. The Working Party at Burlington House, June 2016. From left to right: Sven Lukas, Julian Murton, David Norbury, Martin Culshaw, Dave Evans, Jim Griffiths, Anna Morley, Mike Winter, Dave Giles, Mike De Freitas and Chris Martin (Chair). The Working Party was led by three officers: Mr Christopher Martin as Chairman and Co-Editor; Professor James Griffiths as Lead Editor; and Mrs Anna Morley as Secretary. The Working Party also comprised the seven lead authors of Chapters 2–8 of this EGSP, namely Dr Sven Lukas, Dr David Giles, Professor David Evans, Professor Julian Murton, Dr Michael de Freitas, Professor Martin Culshaw and Professor Mike Winter. Professor David Norbury was later co-opted as a full Working Party member to provide specialist input on the identification and classification of soils that was fundamental to all chapters. While each lead author was solely responsible for ensuring the delivery of their respective chapter, they also enlisted co-authors to draft subsections and provide case studies and contributions. Each chapter of the book has been reviewed by other members of the Working Party, leading to a crossfertilization of ideas and consistency of approach. The book has undoubtedly benefited from this collaborative working. In addition, an independent expert peer reviewer externally reviewed each chapter to ensure that the book is clear and scientifically rigorous. The first meeting of the Working Party was held on 27 February 2012. The Working Party held a further 12 meetings with the final meeting being held on 1 July 2015. Soon after inception of the Working Party, it became apparent that there were significant differences in approach being proposed and adopted by the geomorphologists and engineering geologists within the Working Party, especially around the description and classification of soils and land-forms. An aim of the Working Party was always to bridge the gap between the latest scientific developments and the experience and approaches adopted in engineering practice; two field meetings were therefore held to discuss and agree a common language and methodology as a key output of the Working Party. The first field meeting was held on 12–14 July 2013 to review the glacial deposits of the East Yorkshire coast. A second field meeting was held on 16–18 May 2014 to review periglacial features in Kent. This ‘ground-truthing’ greatly aided the development of a common approach. (1) These Terms of Reference are as agreed by the Periglacial and Glacial Engineering Geology Working Party (PGEGWP). (2) The PGEGWP has been established by the Engineering Group of the Geological Society and comprises officers and specialist participating members who will act as lead authors. The participating members may be assisted by any number of co-authors and corresponding members. (3) The PGEGWP will produce a report, in book format, to complement the earlier report on Tropical Residual Soils produced by an earlier Working Party of the Engineering Group, first published in 1990 and republished in book format in 1997. A similar format was adopted by the Hot Deserts Working Party, which published their book in 2012. It is intended that the book will be a state-of-the-art review on the ground conditions associated with former Quaternary periglacial and glacial environments and their materials, from an engineering geological viewpoint. There will necessarily be appropriate coverage of the modern processes and environments that formed these materials. (4) It is not intended to define the geographic extent of former periglacial and glacial environments around the world, but to concentrate on ground models that would be applicable to support the engineering geological practitioner. (5) The aim of the PGEGWP is to produce a book that will act as an essential reference handbook for professionals as well as a valuable textbook for students and others. The style will be concise and digestible by the non-specialist, yet be authoritative, up-to-date and extensively supported by data and collations of technical information. The use of jargon will be minimized and necessary specialist terms will be defined in an extensive glossary. There will be copious illustrations, many of which will be original, and many good-quality photographs. (6) The content of the report will embrace a full range of topics from the latest research findings to practical applications of existing information. Likely directions of research and predictions of future developments will be highlighted where appropriate. The book will be based on world-wide experience in periglacial and glacial terrain and will draw upon the experience of its members and publications on periglacial and glacial conditions. (7) The Working Party members will be collectively responsible for the whole book. Although each participating member will be the named author or co-author of one or more chapters, all members will be expected to review and contribute to the chapters drafted by other members and would be acknowledged as such. Individual book chapters will be included in the Thomson Book Citation Index. The aim of this EGGS Working Party was to provide an authoritative state-of-the-art review from an engineering geological viewpoint on the ground conditions associated with former Quaternary periglacial and glacial environments including their materials, hazards and the approach to investigation, design and construction. Further details are provided in the Terms of Reference of the Working Party in Text Box 1.1. These Terms of Reference were drafted by the Steering Group and ratified by the Working Party at their inaugural meeting. During the early meetings of the original Steering Group and subsequent Working Party, it became apparent that any book on the engineering geology of inherited or relict glacial and periglacial sediments and landforms needed well-defined limits on its scope. Because of the nature of the subject, these limits were difficult to establish and had to cover geographical extent, discipline boundaries and the needs of potential users. The overriding criterion was that any material provided must meet the requirements of engineering geologists working in ground engineering to support the construction industry. However, it was recognized that the book would also contain a great deal of information relevant to regional and local planning, offshore exploration and development, waste disposal, resource assessment and mining, and the water industry. It was decided that while the Working Party book would concentrate on engineering geology practice in the British Isles, most of the material would be useable for projects throughout NW Europe, including offshore areas such as the North Sea and the Baltic. Indeed, the generic material in the book was regarded as having application in all areas where relict glacial and periglacial terrains have been identified, which includes North America, Northern Asia (mainly Russia) and Southern Hemisphere countries such as Argentina, Chile and New Zealand. By recognizing this broader scope, the Working Party was able to draw on a wider range of literature and case studies to support the research for the book. Active glacial and periglacial processes and the present-day permafrost were seen as part of a completely different engineering geological investigative process, and deemed as being beyond the scope of the book. Nevertheless, to understand the formative mechanisms of relict deposits and landforms, the Working Party decided it would be necessary to provide analogues by referring to the geomorphological processes that are active in present-day glacial and periglacial environments. By seeking actual examples of active glacial and periglacial processes, work from areas outside Europe (notably from North America) was accessed. This is included in Chapters 3 (geomorphological background), 4 (glacial) and 5 (periglacial), but no attempt has been made to provide a comprehensive treatise on glaciology or periglaciation as these disciplines are already well served by existing literature. As a consequence of this decision, it was felt essential to provide a visual glossary to illustrate both the presently active processes and existing sediments in juxtaposition with the relict forms that would be encountered by ground engineers. This glossary is provided in Chapter 3 and one element was to establish a link between modern geomorphological terminologies and longstanding engineering geological nomenclature, along with recommendations for a lexicon that all parties should use in the future. This lexicon had to be based on the requirements of Eurocode 7 and BS5930 (British Standards Institution 2015), but needed to accommodate the terminology employed by geomorphologists in their descriptions of glacial and periglacial sediments. A particular sedimentological term geomorphologists employ is ‘diamicton’, which is a granular deposit with limited fine-grained material that engineering geologists would describe as either gap-graded or part of a soil sequence containing lenses/layers of different grain-size materials. From numerous field discussions, the engineering geologists in the Working Party came to the conclusion that the present terminology in BS5930 was sufficient for describing these materials for ground engineering, but practitioners should be aware that there is an alternative term being used in an adjunct discipline. The Quaternary Period covers the last 2.6 Ma of Earth history and, while it is associated with the concept of the ‘ice ages’, for much of this time the climate was similar to the present day. The Quaternary Period therefore contains both times of expanded glacial ice cover and ‘interglacials’ such as the present Holocene Epoch, which commenced 11.7 ka ago with the climatic amelioration at the end of the Younger Dryas Stadial (see Chapter 2). Geomorphogical processes are active during interglacials as a function of the warmer climatic conditions and changing sea levels. Typically, processes in the interglacials include marine estuary infilling, inundation of offshore areas, coastal erosion and deposition at higher elevations, creation of coastal salt marshes, infilling of river valleys and the development of peat. The decision was made to exclude these interglacial sediments from the book and for the focus to be on the legacy of the Quaternary Period cold ‘stadials’. However, there has to be recognition of the concept of ‘deglaciation’, that is, when ice disappears from a previously glaciated region. Following deglaciation there will be a period when the natural landscape makes the transition from the glacial to non-glacial conditions, and during this period geomorphological features will adjust to the new post-glacial environment. This transition period has been labelled ‘paraglacial’ (Church & Ryder 1972; Ballantyne 2002a, b, 2003; Knight & Harrison 2009), and can have significant engineering geological implications. For example, it takes the vegetation cover a considerable time to establish following deglaciation which, coupled with high winds, can lead to the development of extensive loess deposits (Derbyshire & Meng 2005). Slope instability is a particular issue during this period and Ballantyne (2002b, p. 371) states ‘deglaciation results in the exposure of unstable and metastable sediments’. Specific paraglacial slope instability hazards resulting from these conditions were therefore included in the book, notably quick clay failures, loess liquefaction (or hydrocollapse) and periglacial solifluction movements. However, it was decided to exclude a detailed evaluation of other forms of mass movement as this topic is already covered in detail by existing literature (e.g. Turner & Schuster 1996; Bromhead et al. 2000; Clague & Stead 2012). It is accepted that many landslides would have occurred due to paraglacial processes such as the rock slope failures investigated by, for example, Shakesby & Matthews (1996), Jarman (2003, 2006, 2007, 2009) and Davies et al. (2013) in the British mountain terrains and Norway, and these features remain in the present-day landscape. The identification of these relict features is an important component of all engineering geological site investigations. In addition to the Quaternary Period, there have been other episodes of extensive glacial ice coverage identified in the geological record, notably the Permo-Carboniferous Glaciation of the southern continent of Gondwanaland that lasted nearly 90 Ma (Visser 1987). An evaluation of the sediments of these ancient glaciations (tillites) was excluded from the book, as these were regarded as being more of geological than engineering geological interest and importance. Arising from discussions on the interface between geomorphology and engineering geology, one clear link was found to be in the use of the concept of landsystems by both disciplines as a means of understanding landscape development and the spatial distribution and material composition of landforms (Evans 2013). A previous Engineering Geology Working Party (Griffiths 2001) recommended use of a landsystems approach as part of site investigations as it establishes the spatial and temporal complexity of landforms and helps to define boundary conditions, leading to an understanding of the vertical and lateral variability of material properties. A landsystems methodology also lends itself to the creation of engineering geological ground models (Parry et al. 2014), as required from ground investigations by BS5930 (British Standards Institution 2015). The landsystems approach was therefore decided upon as the basis for presenting the geomorphological background and glacial and periglacial environments, leading directly to the concept of ground model development for engineering geological hazard assessment (Chapter 6), site investigation (Chapter 7) and construction (Chapter 8). A firm recommendation from this book is that the landsystems approach be adopted as the basis for creating the ground model, a conclusion that follows the suggestions included in the book by the Hot Deserts Working Party (Walker 2012). The spatial extent of the relict landforms and sediments can be defined by a landsystems rather than an actual physical extent on the ground. Nevertheless, a generalized low-resolution spatial extent map of glacial and periglacial deposits in Great Britain based on the BGS classification of glacial tills is provided in Chapter 6. As noted above, the Working Party concentrated on the nature of the ground conditions relevant to the construction industry. An aspect of this is that information emerges on the suitability of the relict glacial and periglacial sediments as aggregate resources (Fookes et al. 2001) and their aquifer potential (Stephenson et al. 1988). This aspect of the work is briefly recognized in Chapter 8 in connection with construction. There are a number of sediments in the British Isles whose origin remains debatable, but in the past they have been ascribed as possibly being the result of glacial or periglacial processes. Of these the most widespread is ‘head’ (Ballantyne & Harris 1994), and this was accepted by the Working Party as being a periglacial slope deposit. Similarly, ‘coombe rock’ or ‘coombe deposits’ were identified as being soliflucted chalk debris and scree, although according to the British Geological Survey (2015b) the term is now obsolete and it should be referred to as head. Discussion on both of these deposits is included in the relevant chapters. In southern England, plateau gravels are identified on a number of the BGS maps and various processes have been invoked to explain their origin, including solifluction, marine, coastal and fluvial sedimentation. Based on work on the Isle of Wight (Hopson & Farrant 2009) and the BGS superficial geology lexicon (British Geological Survey 2015c), it is clear that all these interpretations remain valid; indeed, the deposit(s) are most likely to be of composite type. No attempt has been made in this book to disentangle this debate, but engineering geologists should be aware that if these deposits are encountered they might have properties very similar to periglacial head. The sediments specifically excluded from the book that in the past have been tentatively described as possibly Quaternary in origin are the Clay-with-Flints, which are found capping many of the higher Chalk and Upper Greensand hills in southern England. Although it has been subject to periglacial processes, this deposit is now regarded as a residual deposit formed from the dissolution and decalcification of the underlying bedrock of the Chalk Group and Upper Greensand Formation (British Geological Survey 2015a). Finally, some readers will have identified that there are two competing and inconsistent spellings of words relating to the glacial process-regime in the Quaternary and Engineering Geology literature: one taking the form of glacio-, the other that of glaci- (e.g. glaciotectonite v. glacitectonite). Confusingly, some authors use both in the same text (e.g. glaciofluvial, but also glacitectonite). As part of the discussions in the Working Party, we have resolved to unearth which version is grammatically correct and have opted to explain the background to this in the hope of inspiring partially lost good practice. As glacial (and its derivatives) are of Latin origin (glacies, meaning ‘ice’), the root of the word is ‘glaci’ not ‘glac’, a potential misunderstanding that may well be the source of the aforementioned inconsistency. The problem arises because in Latin there is a fifth case (called the ablative, which does not exist in English and most other European languages) that is used to connect two adjectives or an adjective and a noun. For words with roots such as glaci-, this case takes the form in the expression of the letter ‘o’ being required between the two words deemed worthy of connection, for example to connect glaci to the Greek term for science (the correct Greek word is ‘logy’, since it is derived from ‘logos’, and not ‘ology’; cf. Hornby et al. 2010). This can also be seen in many other words where the root ends in a consonant and the ‘o’ is routinely and correctly used out of intuition: nobody would consider ‘gemorphlogy’ (the root of geos is indeed ge-!) or ‘glacilogy’ to be correct. In other words, the presence of a vowel at the end of the root glacidoes not abdicate the requirement of the ‘o’, which signifies the grammatically correct connecting case in Latin (Hornby et al. 2010). The Working Party therefore advocates the use of the term glacioas in glaciofluvial and glaciotectonic. This book is presented as nine chapters with members of the Working Party being the lead author on each one, although most are multi-authored. The abstracts from each of the chapters, excluding Chapter 1, are presented below. The Quaternary is the youngest geological period, beginning 2.58 million years (Ma) ago and including the present day; it is therefore the only geological period that is continuously growing. During the first epoch of the Quaternary, the Pleistocene, extremely cold and warm conditions alternated, frequently over short periods of time. This resulted in processes currently only operating in cold (polar and highmountain) environments extending to and affecting the midlatitudes, including the currently densely populated areas of North America and Europe. In Britain every region has been affected by cold-region processes, which have produced unique sedimentary and geomorphological signatures. Hence, an intimate knowledge of these processes is of direct relevance to engineering geologists and anyone working with natural materials. This chapter reviews the state of the art of (a) the stratigraphic (nomenclatorial) framework of the Quaternary, (b) prominent concepts that are of direct relevance to understanding the detailed overviews in Chapters 3–5; and (c) key findings on the dynamics of these processes and their implications for engineering-geological questions and problems. The development of the conceptual ground model (CGM) is a critical component of any desk study or ground engineering project planning process. A key task of the engineering geologist is to develop the CGM in order to predict the occurrence of known terrain units, elements and facets within a given landsystem, together with communicating the lateral and vertical variability of engineering rocks and soils to be found within that system. This chapter details the significant ground components of the glacial and periglacial landsystem within a geomorphological framework describing the sediments, structures and landforms that could reasonably be expected to be encountered in these terrains. Examples are provided of both modern and relict glacial and periglacial landforms, their mode of formation and their field recognition. Glaciogenic and periglacial sediments are described both in terms of their sedimentological and formal engineering description. The chapter provides a suggested naming nomenclature for these sediments that can be used within BS 5930 description. An extensive photoglossary is presented as a field aide memoir, enabling the engineering geologist to identify these features once on site. Former glaciation style is dictated by physiography and ice dynamics and is encoded in glacial landsystem imprints. As a holistic evaluation of sediment-landform associations and their genetic relationships to the processes involved in terrain development, glacial landsystems can facilitate a preliminary prediction of expected subsurface conditions using depositional surface morphology and wider physiographic setting. This chapter provides exemplars representative of the widely variable glacial depositional environments of the British Isles. The glacial deposits of the British Isles are viewed in terms of the dominant landsystems in the Quaternary sediment-landform record and can be grouped under four categories: (1) ice-sheet-related deposits and (2) upland (hard bedrock) glacial deposits, organized according to subglacial footprints, ice-marginal complexes and supraglacial assemblages; (3) glaciofluvial sediment-landform, organized according to whether they are ice-contact or proglacial in nature; and (4) subaqueous depositional sequences, related to ice-proximal and ice-distal environments. These glacial landsystems are related to the concept of Quaternary domains in an attempt to translate sediment-landform assemblages into a format that has practicability in engineering geology. In this respect the regional distribution of landsystems resonates to some degree with the classification schemes of ‘glaciogenic subgroups’ and ‘till formation domains’. Beyond the glaciogenic subgroup and domain classifications, landsystems further identify localized complexities and ensure a higher level of detail for site investigations where intensive Quaternary geological assessments have yielded a range of data including geomorphological mapping and outcrop investigations with three-dimensional analyses of borehole archives. Periglacial environments are characterized by cold-climate non-glacial conditions and ground freezing. The coldest periglacial environments in Pleistocene Britain were underlain by permafrost (ground that remains at or below 0°C for two years or more), while many glaciated areas experienced paraglacial modification as the landscape adjusted to nonglacial conditions. The growth and melt of ground ice, supplemented by temperature-induced ground deformation, leads to periglacial disturbance and drives the periglacial debris system. Ice segregation can fracture porous bedrock and sediment, and produce an ice-rich brecciated layer in the upper metres of permafrost. This layer is vulnerable to melting and thaw consolidation which can release debris into the active layer and, in undrained conditions, result in elevated porewater pressures and sediment deformation. An important difference therefore arises between ground that is frost-susceptible, and hence prone to ice segregation, and ground that is not. Mass-movement, fluvial and aeolian processes operating under periglacial conditions have also contributed to reworking sediment under cold-climate conditions and the evolution of periglacial landscapes. A fundamental distinction exists between lowland landscapes, that have evolved under periglacial conditions throughout much of the Quaternary, and upland periglacial landscapes, which have largely evolved over the past c. 19 ka following retreat and downwastage of the last British–Irish Ice Sheet. Periglacial landsystems provide a conceptual framework to interpret the imprint of periglacial processes on the British landscape, and to predict the engineering properties of the ground. Landsystems are distinguished according to topography, relief and the presence or absence of a sediment mantle. Four landsystems characterize both lowland and upland periglacial terrains: (1) plateau landsystems; (2) sediment-mantled hillslope landsystems; (3) rock slope landsystems; and (4) slope-foot landsystems. Two additional landsystems are also identified in lowland terrains where thick sequences of periglacial deposits are common: (5) valley landsystems and buried landsystems. Finally, (6) submerged landsystems (which may contain more than one of the above) exist on the continental shelf offshore of Great Britain. Individual landsystems contain a rich variety of periglacial, permafrost and paraglacial landforms, sediments and sedimentary structures. Key periglacial lowland landsystems are summarized using ground models for limestone plateau-clay-vale terrain and caprock-mudstone valley terrain. Upland periglacial landsystems are synthesized through ground models of relict and active periglacial landforms, supplemented by maps of upland periglacial features developed on bedrock of different lithology. In engineering terms, all materials deposited as a result of glacial and periglacial processes are transported soils. Many of these deposits have engineering characteristics that differ from those of water-lain sediments. In the UK, the most extensive glacial and periglacial deposits are tills. Previously, engineering geologists have classified them geotechnically as lodgement, melt-out, flow and deformation tills, or as variants of these. However, in this book tills have been reclassified as: subglacial traction till, glaciotectonite and supraglacial mass-flow diamicton/glaciogenic debris-flow deposits (see Chapter 4, sections 4.1–4.3). Because this classification is new, it is not possible to relate geotechnical properties and characteristics to the subdivisions of the new classification. Consequently, the domain/stratigraphic classification, recently developed by the British Geological Survey and others, has been used and their geotechnical properties and characteristics are discussed on this basis. The geotechnical properties and characteristics of the other main glacial and periglacial deposits are also discussed. For some of these (e.g. glaciola-custrine deposits, quick clays and loess), geohazards relating to the lithology and/or fabric of the deposit are discussed along with their properties. Other geohazards that do not relate to lithology and/or fabric are discussed separately as either local or regional geohazards. In some cases (e.g. glaciofluvial sands and gravels), the geotechnical properties and behaviour are similar to sediments deposited under different climatic conditions; these deposits are therefore not discussed at length. Similarly, some of the local geohazards that are found associated with glacial and periglacial deposits relate to current interglacial climatic conditions and are not discussed here. Examples include landsliding and highly compressible organic soils (peats). The starting point of any such investigation is a conceptual model of the ground that subsequent investigation tests and refines; investigations conducted without such a model can easily become sterile and expensive exercises in collecting data. Such a model starts with knowledge of landscape, cold climate processes and their products, initially refined with the aid of a desk study. This then develops with each phase of the investigation, starting with what is known via desk studies, and progressing though what can be readily seen by walk-over surveys and shallow investigations, including surface geophysics and remote sensing, all leading towards a model that can be tested directly by various intrusive investigations. Techniques appropriate for such investigations, including sampling, in glaciated and periglaciated ground both onshore and offshore are reviewed. The initial conceptual model starts with little more than an idea and a broad outline, and evolves as the investigation progresses. It should continue to evolve throughout construction as more and more of the ground is exposed and its behaviour is better known; in this way, the ground model can be thought of as a living document, especially appropriate in such variable ground. The chapter concludes with a review of how this information can be brought together as threedimensional models that effectively communicate the knowns and unknowns of a volume of ground and their associated risks, in both deterministic and probabilistic ways. Relict glacial and periglacial environments are widespread, and the deposits that they are associated with mean it is inevitable that the design and construction of many projects will be influenced by their presence and nature. Tills and other glaciogenic deposits prove to be particularly challenging in this context for reasons that include: the spatial variability of the nature of the deposits; the wide range of particle sizes often included within a given soil, including large-sized particles; spatial variation in soil type and properties; variation in depth to rockhead and variable degrees of weathering and alteration; the presence of groundwater, that is misinterpreted as perched water, as well as sub-artesian and artesian conditions; the presence of solution features and fissures, partly or completely infilled with soft or loose material; and the presence of (often shallow) shear surfaces at residual strength. In this chapter, some of the more common problems and associated solutions associated with earthworks and man-made slopes, tunnels and underground structures, dams and reservoirs, foundations, and offshore engineering and installations are reviewed. It is important that great care is taken in addressing the influences of variability, complexity and uncertainty inherent in glacial/periglacial soil formations at all stages of the construction process, from feasibility to end-of-project activities, such as preparation of the as-built drawings. As stated in the objectives (Section 1.3.3), the purpose of the Working Party is to bring together the latest research in glacial and periglacial geomorphology and to provide guidelines on how this can influence engineering geological practice. The Working Party book is not intended to set out a code of best practice for engineering geology in relict glacial and periglacial terrains, nor does any of the material presented supplant the need for properly designed and effective site investigations. However, given the expertise and experience of the members of the Working Party, the chapter authors and reviewers, the guidelines and suggestions in the book are an information source of enormous importance for all engineering geologists, geotechnical engineers and geomorphologists who have to undertake any form of investigation, design or construction in a relict glacial and glacial environment. This book is primarily, although not exclusively, targeted at the world of engineering and the need to create structures that are safe, economic and environmentally sustainable. Fundamental to this focus is the need for all types of construction risk to be evaluated. Baynes (2010) divided geotechnical risk into three main categories: project management; contractual; and technical (Table 1.2). This book concentrates on how to identify and evaluate the technical risks associated with the necessity to build an adequate ground model that meets the requirements of BS5930: 2015 (British Standards Institution 2015). Project management Poor management of entire geo-engineering process An inadequate understanding of the importance of ground conditions, for example a decision to submit a tender price with no risk weighting for geotechnical factors. Contractual Poor management of site investigation and contract documentation An inadequate understanding of the importance of ground conditions resulting in poor acquisition, understanding and/or communication of site investigation information; this often leads to claims based on unforeseen ground conditions. Technical: analytical Unreasonable or unsuitable analytical model chosen An inadequate understanding of the importance of ground conditions and analytical methods. Technical: properties Unreasonable design values chosen An inadequate understanding of the importance of ground conditions and field and laboratory testing of materials. Technical: geological Unforeseeable geological details Geological conditions that are very variable (although it is accepted that any ground investigation will only sample a small part of the site and an investigation that obtains all geological and geomorphological details is impossible). Inherently hazardous ground conditions Geological conditions and geological/geomorphological processes that involve hazards such as large ground movements, voids, aggressive soil and groundwater chemistry, volcanoes, etc. Unforeseen ground conditions An inadequate understanding of the importance of high-quality ground investigation, resulting in unforeseen ground conditions being encountered during construction. The suggested approach for using this book, as outlined in Figure 1.20, therefore places the emphasis on evaluating the risks at a site. Initially it must be established whether or not the site to be investigated has ever been subject to glacial and/or periglacial processes. Reference to Chapter 2 will enable users to identify where their site lies with respect to the presently understood limits of glacial and periglacial processes during the cold phases of the Quaternary Period. Indeed, reference to the maps of the British Isles and Europe during the Devensian indicate that any site will have been affected by periglacial conditions (Fig. 5.8); a substantial part of the UK was covered by glacial ice at various times during the Quaternary (Fig. 2.7). Suggested approach to using the Working Party book. Once it has been established that the site has been subject to glacial and/or periglacial processes, then desk studies and a field reconnaissance should be undertaken. To help identify the glacial and periglacial landforms and sediments on a proposed site, reference should be made to the visual lexicon provided in Chapter 3. This comprehensive collection of images and their descriptions utilizes the most up-to-date geomorphological nomenclature and can be regarded as a visual checklist of the landforms and sediments that might be encountered on a site. This chapter also places the emphasis on identifying the geomorphological landsystem, as this forms the basis for the development of an engineering geological ground model. The formulation of the appropriate model needs to draw on the latest research in glacial and periglacial geomorphology provided in Chapters 4 and 5, respectively. Drawing together all the information from Chapters 3–5 will enable the initial conceptual ground model of the site to be compiled. As recommended in Chapter 6, using these initial ground models the natural hazards and the first technical risk register can be drawn up, including the preliminary identification geotechnical design parameters. It is worth checking the case studies presented in Chapter 9 at this point to see if there are any examples of similar ground conditions that can help in the next stage, namely the design of the ground investigations. Ground investigations should be designed according to the requirements of BS5930: 2015 (British Standards Institution 2015) or their equivalent outside the UK. Nevertheless, Chapter 7 provides a comprehensive description of available investigative techniques and their applicability to ground investigations in former glaciated and periglaciated terrain. The ground investigations must be designed to meet the requirements of the proposed development and an indication of these, for a range of engineering situations, are provided in Chapter 8. Following the completion of the ground investigations, the ground model and risk registers must be updated in preparation for detailed design and construction. However, the ground model must remain a live document that is continually updated as new data become available during construction investigations and excavations. Engineering science progresses not only through the publication of fundamental and applied research, but also through the publication of case studies. This is demonstrated by the case histories of construction failures presented in Section 1.2 and the case studies in Chapter 9. Wherever possible, the publication of material in the scientific literature on the success or otherwise of a project must therefore be encouraged to avoid ‘reinventing the wheel’ (Griffiths 2014). The authors wish to thank Tony Waltham, Keith Gabriel, Dave Giles, Stephen Fort, David Norbury and Christopher Kilsby for providing the case histories used in this chapter. In addition, we are grateful to Dave Giles for producing Figures 1.6, 1.7, 1.10, 1.11 and 1.13–1.15.
. Glaciotectonic Landforms and Structures.
. The Periglaciation of Great Britain.
. Basic Environmental and Engineering Geology.
. Spurn Sheet 53Degrees N-00 Degrees British Geological Survey 1:250,000 Series Quaternary Geology Map.
. Code of Practice for Ground Investigation.
. Landslides in Research, Theory and Practice.
. Landslides: Types, Mechanisms and Modelling.
. Aggregates: Sand, Gravel and Crushed Rock Aggregate for Construction Purposes.
. The Quick Clay Landslide at Rissa, Norway.
. Land Surface Evaluation for Engineering Practice.
. Pile Foundations for Buildings and Structures in Collapsible Soils.
. Oxford Advanced Learner’s Dictionary.
. Climate Change 2014: Mitigation of Climate Change.
. The Heritage of Engineering Geology; the First Hundred Years.
. Periglacial and Paraglacial Processes and Environments.
. Historical Tunnels in the Swiss Alps: Gotthard, Simplon, Lötschberg.
. In Situ Tests in Geotechnical Engineering.
. Stabilization of Undisturbed Quick Clay by Salt Wells.
. Engineering in Glacial Tills.
. Landslides: Investigation and Mitigation. Transportation Research Board Special Report.
. Hot Deserts: Engineering, Geology and Geomorphology. Engineering Group Working Party Report.
. Foundations of Engineering Geology.